This stereo pre-amplifier is designed so you can use a magnetic phono cartridge (low level) with an amplifier/receiver/console which only has high level inputs such as crystal or ceramic phono, line or AUX inputs. Typically a magnetic cartridge provides better sound quality and is less wearing on good records. The pre-amplifier is housed in a sturdy but compact metal case the size of a package of cigarettes and operated from a single rectangular 9-volt transistor radio type battery. 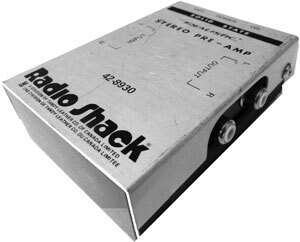 Realistic Battery Operated Stereo Preamp / 42-8930 Preamp owners manual, service manuals and schematics are for reference only and the Vinyl Engine bears no responsibility for errors or other inaccuracies. The PDF files are provided under strict licence. Reproduction without prior permission or for financial gain is strictly prohibited. This website is not affiliated with or sponsored by Realistic.